We recommend that all parties be booked at least two months in advance to secure your preferred party date. 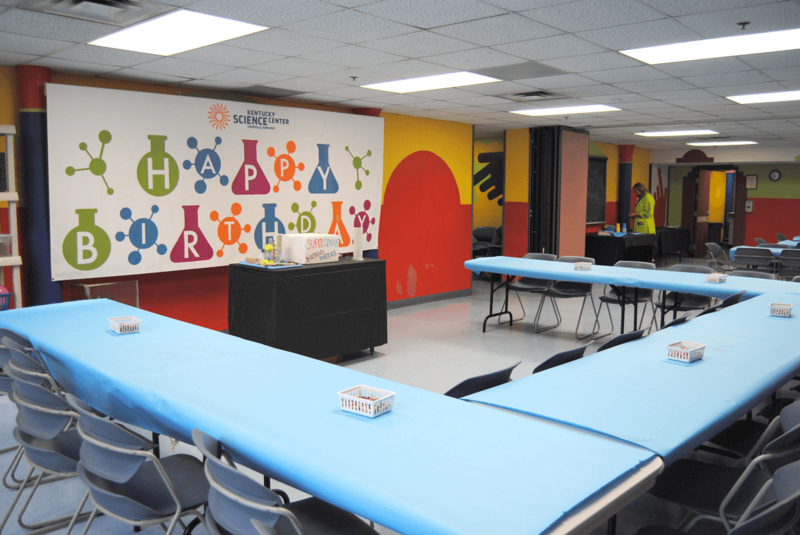 Visit kysciencecenter.org/rentals-and-birthdays/birthday-parties/ to view available dates and book your party. All available dates and times will be listed on our availability calendar. All parties in blue are available to be booked. All parties must be paid in-full at the time of booking. Sure! Most of our parties are for ages 3-12, but we do offer parties for younger and older children as well. Please contact the birthday party hotline at 502-560-7154. If you would like to schedule an event for an adult, please contact the rentals department at 502-560-7141. Can I book one party for multiple children? We can host parties for multiple children, but are not able to increase the included 20 children and 20 adults to accommodate more guests. What will I receive after I book? Any rescheduling of your party’s date or time will result in a $50 rescheduling fee. This will be due at the time of the rescheduling. Please note that a specific date or time cannot be guaranteed when rescheduling. In case of inclement weather, please watch the local news or our social media channels to see if the Kentucky Science Center is closed. You can also call our weather line at 502-561-6100. If the Kentucky Science Center is closed, we will reschedule your party at no additional fee. Specific dates or times cannot be guaranteed. Should you cancel your party fewer than three weeks before the scheduled date, the Science Center will refund 60% of your party fee. Parties canceled more than three weeks before the party date will have 80% of the party fee refunded. Your party will start promptly at the time you have booked, and you may enter the Party Room 15 minutes prior to that time to set up presents or decorations. A Kentucky Science Center staff member will meet your guests in the Lobby. Once all of your guests have arrived, they’ll be escorted to the Party Room. To ensure that all of your guests are able to be escorted to the party room together we recommend that you ask your guests to arrive 10-15 minutes before your scheduled party time. A member of your party can meet latecomers in the Lobby, or you can direct them to the Ticket Desk. All guests over the allotted number for your party are an addition feel ($5 per adult, $10 per child.) Payment is due in full before the party begins. Children under 2 will not be charged an additional guest fee, but they are included in your guest count for fire code safety. There will be no refund for guests who are no-shows. If I have guests who are members, do they get in free? Kentucky Science Center members do not receive a free or discounted price as a guest of a birthday party. How will the timeline of my party look? 12:45-1:00: Party family arrives, and is taken down to Party Room to decorate or set-up. 1:05-1:30: Science Activities. Activity time varies depending on the theme and guests’ interests. 2:40-3:00: Ice cream and/or presents in the party room. All items must be out of the room at the end of your 2 hours. Parents are responsible for getting all party items out of the room and to their car after their 2-hour party time. Kentucky Science Center is not responsible for holding gifts after each party. *Please note, this is a general party outline and each party may look slightly different. We provide a table covering and a birthday party banner. You may bring additional decorations, as long as they don’t hang from the ceiling or walls. Due to safety concerns, piñatas and noisemakers are not allowed. We offer balloons bouquets through Ah, Whatta Bout Mimi’s–the link is included in your confirmation email! How many people does my ice cream feed? We provide refreshments for up to 20 children. If you’d like to add an additional ice cream you may do so up to three weeks before your scheduled party. Can I bring additional food or drinks? Boxed lunches can be purchased from Subway for $5 per lunch, but note that due to time limitations, additional food may cause other aspects of the party to be shortened. For the safety of all visitors, we ask that any additional snacks brought in be nut free. Paper products for additional food will not be provided by the Science Center, and we do not have food storage. Can I add a film? Will my guests have to pay to park? Guest parking is not included in the party package but can be purchased for an additional fee.